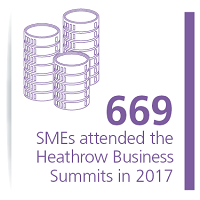 The Flagship Heathrow Business Summit will take place on Tuesday 27th November 2018 at the Hilton London Heathrow Terminal 5. Below are a list of Heathrow’s supply chain who will be promoting their procurement opportunities to meet small and medium sized businesses. Charges will apply to register and attend the Flagship Business Summit. Meet and network with exhibitor partners including the Local Councils, Chambers of Commerce, Local Enterprise Partnerships, and the Department for International Trade. Meet local colleges and universities to support your skills and recruitment needs.